This book was written with a view to sorting our some of the muddles and misreadings - especially misreadings of Kant - that have charaterized recent postmodernist and post-structuralist thought. For these issues have a relevance, as Norris argues, far beyond the academic enclaves of philosophy, literary theory, and cultural criticism. Thus he makes large claims for the importance of getting Kant right on the relation between epistemology, ethics and aesthetics; for pursuing the Kantian question 'What is Enlightenment?' as raised in Foucault's late essays; or again, for recalling William Empson's spirited attempt to reassert the values of reason and truth against the orthodox 'lit crit' wisdom of his time. These are specialized concerns. But for better or worse it has been largely in the context of 'theory'- that capacious though ill-defined genre- that such issues have received their most scrutiny over the past two decades. 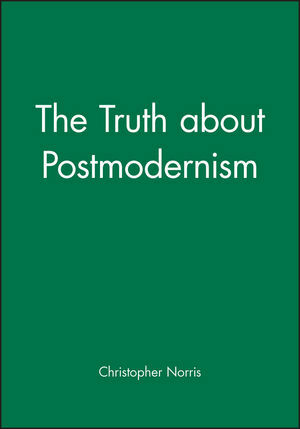 As its title suggests, The Truth About Postmodernism disputes a good deal of what currently passes for advance theoretical wisdom. Above all it mounts a challenge to those fashionable doctrines - variants of the 'end-of-ideology' theme - that assimilate truth to some existing range of language-games, discourses, or in-place consensus beliefs. Norris's book will be welcomed for its clarity of style, its depth of philosophical engagement, and its refusal to endorse the more facile varieties of present-day textualist thought. It will also serve as a timely reminder that the 'politics of theory' cannot be practised in safe isolation from the politics (and ethics) of activist social concern. Christopher Norris is the author of The Truth about Postmodernism, published by Wiley.